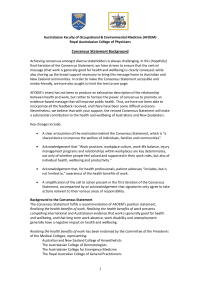 These position statements are explanations of the association’s position on political, ethical, social, cultural and practice issues that influence client well-being, the role and practice of Occupational Therapy New Zealand Whakaora Ngangahau Aotearoa, or that affect the practice of occupational therapy in this country. While these policies are developed in consultation with occupational therapists/nga kaiwhakaora ngangahau working in New Zealand, they are frequently time limited. If you are wishing to use statements that are more than two years old please confirm their current status with the executive director of OTNZ-WNA. 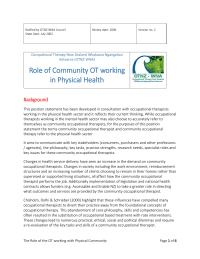 JUN 2013 - The purpose of this statement is to describe the role of the occupational therapists/nga kaiwhakaora ngangahau in providing services to people and their families/whānau who are living with a life limiting illness, and those who are in the terminal phase of life in Aotearoa New Zealand. evaluation of the effectiveness and outcomes of programmes and interventions from an occupational perspective. 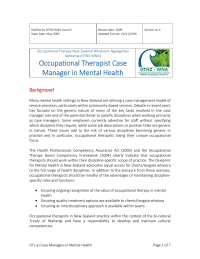 OCT 2012 - OTNZ-WNA Aotearoa considers that supervision enhances professional development, clinical competence and safe practice, while contributing to reduction of risk to both client(s) and practitioner(s). OTNZ-WNA Aotearoa views supervision as a supportive, empowering and constructive process that promotes anti-discriminatory, culturally safe and gender appropriate practice. It is important that the kaiwhakaora ngangahau/occupational therapist (the supervisee) has a choice of supervisor wherever practicable. OTNZ-WNA acknowledges that nga kaiwhakaora ngangahau/occupational therapists will need a range of supervision options as they progress through their career paths. OCT 2012 - Occupational Therapy New Zealand Whakaora Ngangahau Aotearoa supports the World Health Organisation's call for interprofessional education and collaborative practice and advocates for occupational therapists/nga kaiwhakaora ngangahau to be leaders and integral members in these collaborative models of care. 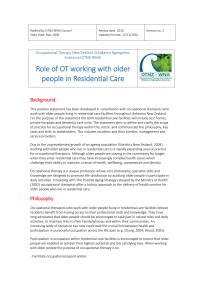 2012 - This statement identifies key issues for the roles and areas of practice for occupational therapists working with older people in residential care. MAR 2011 - OTNZ-WNA Nga Whakaora Ngangahau Aotearoa has become a signatory to the consensus statement on the Health Benefits of Work initiated by the Australasian Faculty of Occupational and Environmental Medicine (AFOEM) part of The Royal Australasian College of Physicians (RACP). Full details of the background to the statement, position paper and signatories can be found at AFOEM. 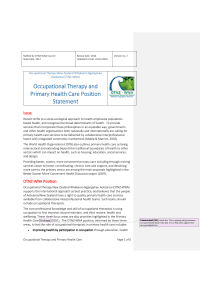 AUG 2009 - This position statement has been developed to inform key stakeholders (occupational therapists, primary health organisations, consumers, health professionals, health funders, planners, and policy makers) of the role occupational therapy can play within primary health care, including key tasks and potential areas of practice. 2007 - This position statement supports the building on inclusive communities within the belief that all children and young people have the right to equal opportunity when it comes to education in New Zealand/Aotearoa. 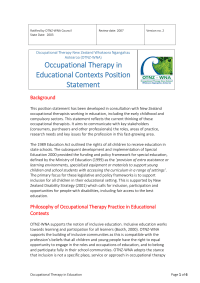 Occupational Therapy New Zealand Whakaora Ngangahau Aotearoa adopts the stance that inclusion is not a specific place, service or approach in occupational therapy service delivery but that occupational therapists should work to support inclusion and limit exclusion regardless of the setting. In line with the profession’s belief in child and family-centered practices, OTNZ-WNA supports the right of the parent and child to select the appropriate place of learning. MAY 2005 - This statement provides an explanation on the key issues for occupational therapy service provision within a case management model. 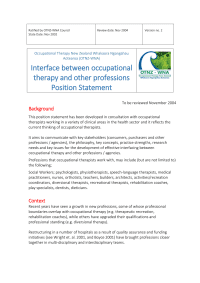 NOV 2002 - This position statement aims to communicate with key stakeholders, the philosophy, key concepts, practice strengths, research needs and key issues for the development of effective interfacing between occupational therapy and other professions/agencies. Professions that occupational therapists work with, may include (but are not limited to) the following: Social Workers, psychologists, physiotherapists, speech-language therapists, medical practitioners, nurses, orthotists, teachers, builders, architects, activities/recreation coordinators, diversional therapists, recreational therapists, rehabilitation coaches, play specialists, dentists, dieticians. 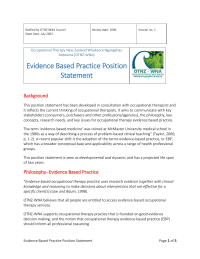 JUL 2002 - This position statement has been developed in consultation with occupational therapists and it reflects the current thinking of occupational therapists. It aims to communicate with key stakeholders (consumers, purchasers and other professions/agencies), the philosophy, key concepts, research needs, and key issues for occupational therapy evidence based practice. The term ‘evidence-based medicine’ was coined at McMaster University medical school in the 1980s as a way of describing a process of problem-based clinical teaching” (Taylor, 2000, p. 1-2). A recent popular shift is the adoption of the terms evidence-based practice, or EBP, which has a broader conceptual base and applicability across a range of health professional groups. 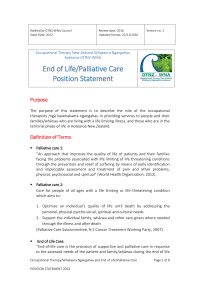 This position statement is seen as developmental and dynamic and has a projected life span of two years.